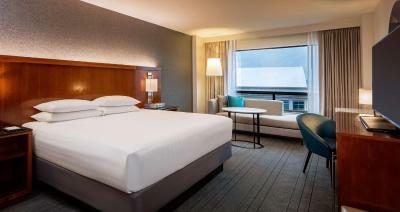 Lock in a great price for Hyatt Regency Crystal City at Reagan National Airport – rated 8.8 by recent guests! Everything! Saved my life after my flight was canceled and I was stranded in DC overnight. Thank you again! Aminda give us a EXCELLENT service. She was very helpful. We love the hotel! I had a great time! My only problem was the Cinibar restaurant was closed and we went to the lobby bar and waited 25 minutes for a server. CELINA came and she was like do you all know what you want to order. We asked her to I troduced herself. She gave her name and asked to take our order. We wanted her name just to know who was serving us. Then she was rude and say I'm not serving your food I'm just taking your order. At this point we had enough of her unprofessionalism so we left and went to a restaurant close to the hotel where the service was exceptional from we walked in. Entire staff was very friendly. From the valet to the housekeepers. Conveniently by the airport, and along minutes into DC. I lucked up and got a great value. Comfortable room that I used for working and sleeping between flights. 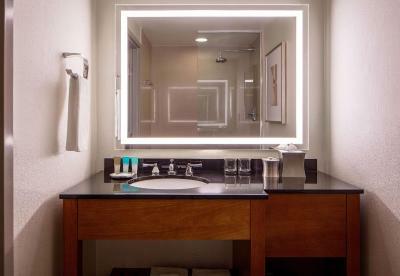 Great suite for businesses, quiet hotel, and lovely amenities. The king-sized bed was utter perfection and I could work all day the next day with flawless wi-fi connection and quiet. The bathroom was also state of the art and the room was sufficiently sized. I loved it! Everyone was so nice. The room was so comfy. My baby slept all thru the night. Was able to leave my car there while on a trip. Efficient service to airport. Lots of restaurants nearby. The bed was so comfortable. The shower was very unique and cool. Had a late dinner and really enjoyed the chicken wings and sweet potato fries. The shuttle to the airport was timely and convenient. 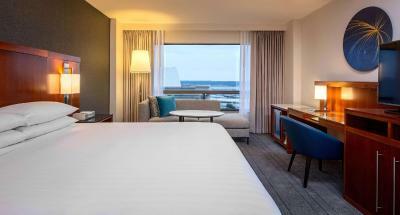 Hyatt Regency Crystal City at Reagan National Airport This rating is a reflection of how the property compares to the industry standard when it comes to price, facilities and services available. It's based on a self-evaluation by the property. Use this rating to help choose your stay! 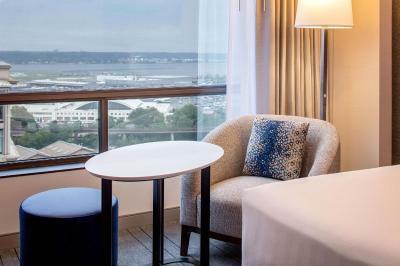 Located 4 mi from historic Washington, D.C., this hotel in Arlington, Virginia offers free shuttle service to Reagan National Airport. Free WiFi is offered. 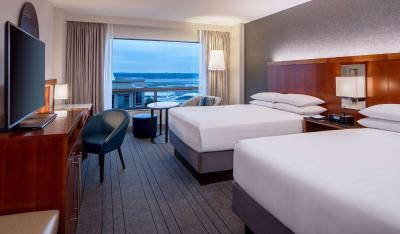 Hyatt Regency Crystal City at Regan National Airport features guest rooms with work areas, coffee makers and flat-screen TVs. Guests can go for a swim in the outdoor pool or work out in the 24-hour fitness center. There is also a business center, an on-site restaurant and bar and concierge arranged spa services. The Pentagon is 1.6 mi from the property, while Arlington National Cemetery is 4.2 mi away. This is our guests' favorite part of Arlington, according to independent reviews. This property is also rated for the best value in Arlington! Guests are getting more for their money when compared to other properties in this city. 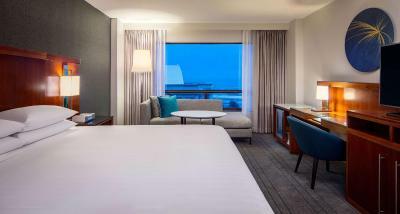 When would you like to stay at Hyatt Regency Crystal City at Reagan National Airport? 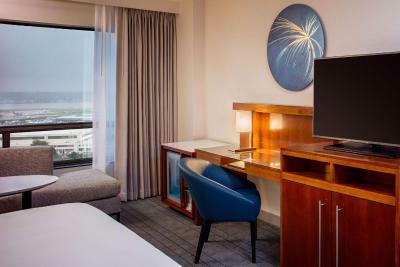 This room features a work desk, tea/coffee maker and flat-screen cable TV. Private parking is available on site (reservation is not needed) and costs USD 45 per day. This room features a seating area, work desk, tea/coffee maker and flat-screen cable TV. This suite features a separate seating area, a flat-screen cable TV and a balcony. Our property is special because of the people who work here. With an average tenure of 12 years at the hotel, our staff has been providing authentic hospitality for many years. We care for people so they can be their best! We continuously listen, learn and evolve to both meet and anticipate the needs of our guests. We believe that being your best is about being your true self - engaged, fulfilled and ready to take on the world. 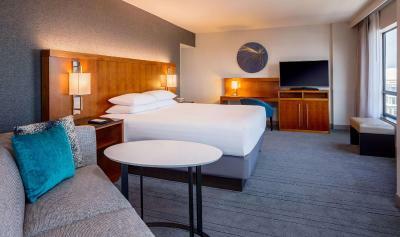 House Rules Hyatt Regency Crystal City at Reagan National Airport takes special requests – add in the next step! Hyatt Regency Crystal City at Reagan National Airport accepts these cards and reserves the right to temporarily hold an amount prior to arrival. Parking was too high , you advertise a heated pool but yet your pool and jacuzzi is not open year round. After midnight, the front desk did not pick up the phone, view, they didnt have slipper services. And plus, there’s something problem with refrigerator during the dawn. They didnt tell me about deposit and caution fee, so that i was annyoed. No microwave in the rooms. The water charge label was insane. Not a good hotel location. Doesn’t even offer parking. Just valet for $40. I did not like that there was no parking- for the price I paid for parking I would have stayed at a Kimpton in DC- also the valets lost my car-TWICE!!! When we arrived valet was not readily available and we had to wait , same at check in- there was a large unruly party ahead of us, sofa bed was NOT made up - it was past 1AM and they just sent up sheets- my daughter was uncomfortable all night. The other thing I don’t like is that the Starbucks is not open st lunch time. I must say for the most part, staff is very aloof. There is even no complementary water for non-members. We will charge you 3$ blah blah. Why don't you give it free?